After watching the Boston Celtics reach consecutive conference championships, Boston Celtics fans are starting to believe. Demand for tickets has pushed the average asking price of a 2018-19 Boston Celtics ticket is up 40% compared to last season. 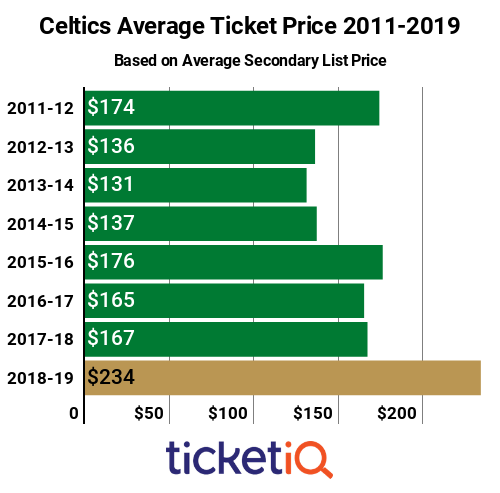 Below is how Celtics tickets prices stack up on the secondary market and across the league. As you can see, prices are at their peak since TicketIQ.com began tracking data in 2011. The next highest average was in 2015-16, when Boston finished second in the Atlantic Division, but got knocked out of the playoffs in the first round. Last year, the Celtics were second in both the Atlantic Division and the Eastern Conference. They lost to Cleveland in seven games in the Eastern Conference Final. With a $234 average asking price, Celtics tickets are ranked No. 5 in terms of price across the NBA. The Golden State Warriors are ranked No. 1 with a $463 average asking price. Celtics tickets have always been tough to come by, and season tickets are sold out once again, though fans can join a waiting list. Single-game tickets are sold out for many of the biggest games, including the October 16 home opener against the Philadelphia 76ers. But Ticketmaster does have some primary market tickets available through the season, including seats in Balcony 325, Row 15 for $52.50 for the December 10 New Orleans Pelicans game or in Balcony 310, Row 5 for $105 for the December 21 Milwaukee Bucks game. On the secondary market, TicketIQ.com has seats available for all games, many with the company’s Low Price Guarantee. It’s no surprise that the two most expensive games at TD Garden are the January 26 Golden State Warriors and February 7 Los Angeles Lakers games. There are 39 NBA titles between the three times – and Boston has 17 of those. The defending champion Warriors are the NBA’s currently royalty, having won three titles in the last four seasons. 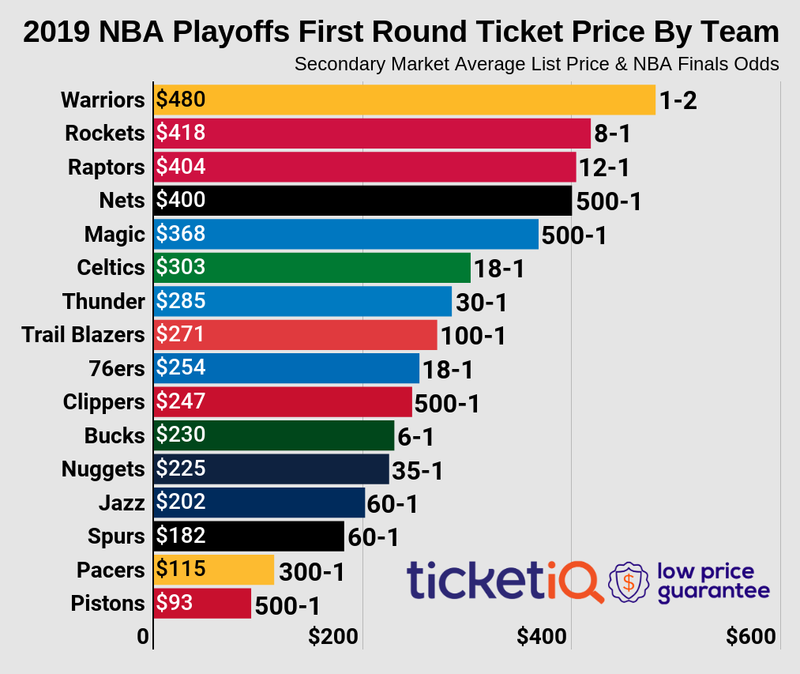 The average asking price for the Warriors game is $632 with a get-in price of $185 while the average asking price for the Lakers game is $628 with a get-in price of $200. 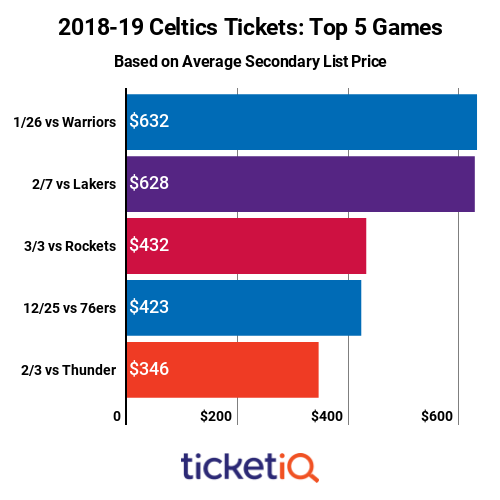 It’s fair bet that ticket prices will rise if the Celtics and Warriors continue to be contenders or the new LeBron Lakers can find their way back into the mix.